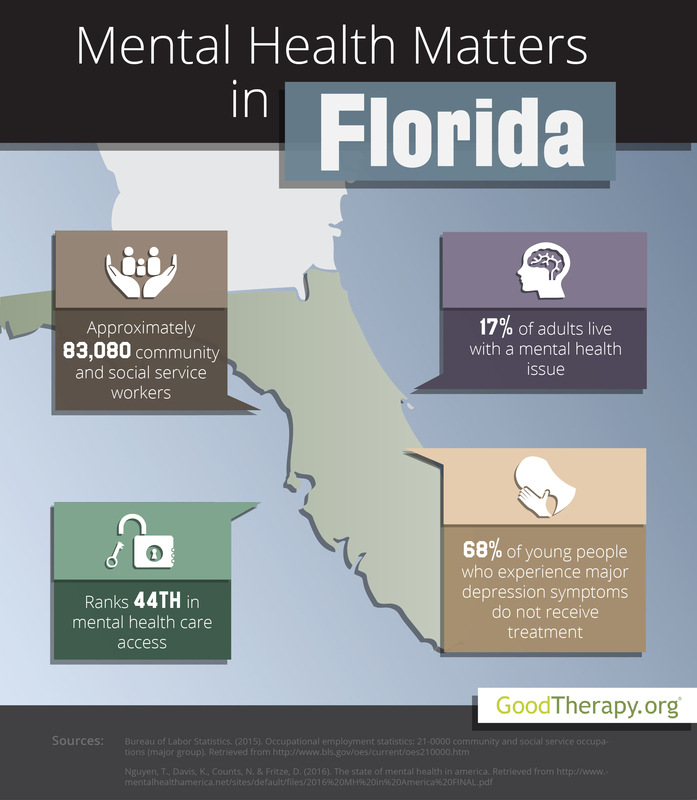 Find a therapist in Florida with GoodTherapy.org. According to the Bureau of Labor Statistics (BLS), the state of Florida employed 83,080 people in social service and community-related professions in 2015. Occupations in this field included work as marriage and family therapists, counselors at residential treatment centers, community health workers, child psychologists, clergy members, parole officers, guidance counselors, and depression treatment therapists. In Florida, residents in this career field and related jobs earned an average annuall wage of $43,350 and served an estimated population of 20.2 million people. Out of all 50 states and the District of Columbia, Florida received an overall rank of 25th for mental health conditions and practices, suggesting a median rate of both mental health issues and access to mental health care. This ranking was awarded in the 2016 edition of the State of Mental Health in America survey. Florida was also ranked 7th in the prevalence category, which indicates a relatively low prevalence of mental health issues for residents. However, an access to care ranking of 44th suggests many people who have mental health concerns may not receive the care they need. Therapists in Florida, researchers from Mental Health America (MHA), and other local mental health providers contend that social factors such as high rates of homelessness, high rates of toxic chemical release, high rates of violent crime, and low rates of high school graduation correlate with the state’s low access to care ranking. In Florida, roughly 25% of adults who experience mental health concerns are uninsured, and 64% of adults with mental health issues do not receive mental health services. The state was ranked 46th and 48th in these respective categories. The mental health of young people within the state is also of paramount concern to mental health providers. The Substance Abuse and Mental Health Services Administration (SAMHSA) claims the percentage of adolescents in Florida who perceive no significant risk from smoking cigarettes daily decreased from 33.4% in 2009 to 29.6% in 2013. The national average for this behavioral health category in 2013 was 35%. At 4.9%, the percentage of teenagers in Florida who smoke cigarettes was lower than the national percentage of 6.1% in 2012-2013. While these statistics show a relatively low percentage of cigarette use among young people, both the SAMHSA 2014 report and the MHA 2016 survey indicate the use of drugs—such as marijuana, cocaine, heroin, hallucinogens, nonmedical psychotherapeutics, and inhalants—among adolescents is a major concern for therapists in Florida. The SAMHSA report shows the percentage of teens who perceive no significant risk from smoking marijuana once a month increased from 68.1% in 2009, to 73.7% in 2013. According to the 2016 MHA study, Florida is ranked a mid-range 24th for young people with dependence on alcohol or drugs.